In 2002, flood waters from Canyon Lake dam reservoir in central Texas were diverted into an emergency spillway at nearly 200 times the normal flow rate. 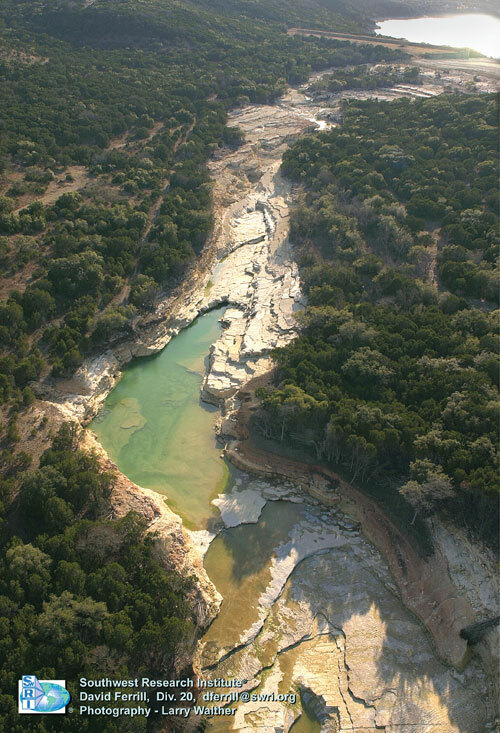 The resulting flood event, which lasted for six weeks, removed trees and sediment and excavated a 7 m deep and >1 km long canyon into the limestone bedrock. A paper by Lamb & Fonstad called Rapid formation of a modern bedrock canyon by a single flood event published in Nature Geoscience this week documents the patterns left in the landscape and reconstructs the hydraulics involved in this catastrophic flood. I encourage those interested in the details of sediment transport and bedrock incision to read the paper. But what I want to discuss in this post is an issue that will come up as a result of this study — an issue that I can almost feel bubbling up as I write this. In fact, I’m certain that someone, somewhere is abusing the results of this study in an attempt to claim that because significant change to the Earth’s surface can occur abruptly then it follows that all geologic change must be the result of abrupt and cataclysmic events. This is a false dichotomy pushed by neocatastrophists that are typically, but not always, associated with the viewpoint that the Earth is ~6,000 years old. When the history of the science of geology is taught it commonly includes the classic uniformitarianism vs. catastrophism debates of the late 1700s-early 1800s. The uniformitarianists, so the story goes, argued that the changes we see in the geologic record were the result of minor and gradual processes that accumulated over time — from processes that we can see working on the landscape today. Catastrophists believed the same geologic products were the result of cataclysmic events that reshaped the land abruptly. Uniformitarianism is a dual concept. Substantive uniformitarianism (a testable theory of geologic change postulating uniformity of rates or material conditions) is false and stifling to hypothesis formation. Methodological uniformitarianism (a procedural principle asserting spatial and temporal invariance of natural laws) belongs to the definition of science and is not unique to geology. Methodological uniformitarianism enabled Lyell to exclude the miraculous from geologic explanation; its invocation today is anachronistic since the question of divine intervention is no longer and issue in science. Substantive uniformitarianism, and incorrect theory, should be abandoned. Methodological uniformitarianism, now a superfluous term, is best confined to the past history of geology. In other words, the original notion of uniformitarianism — that there is uniformity in rates — is false. Although the science has discarded this erroneous concept, it is what modern catastrophists use as a straw man in their arguments. And, unfortunately, we see glimpses of it in mainstream science writing and reporting of geologic processes. The nuance of Gould’s paper from nearly 50 years ago is lost within the compelling story of pitting one absolute versus another. I would argue that rapid and significant processes are included within our current understanding of processes. For example, I study the processes and deposits of turbidity currents, which are essentially submarine avalanches of sediment. The recurrence of such events varies but is typically on the order of hundreds to thousands of years. Moderate to large turbidity current events would surely be labeled “catastrophic” from our point of view. Yet, entire sedimentary basins are filled with the deposits of hundreds of thousands of individual catastrophic events. While each event may be short-lived and cataclysmic, they occur very regularly over time and incrementally stack to produce a stratigraphic succession. We might consider some volcanic systems similarly — each eruption event might be catastrophic, but over time this is how the volcano is incrementally constructed. We suspect that well developed vertical and horizontal joints at Canyon Lake Gorge define blocks of bedrock that have little interlocking along their boundaries, rendering their behavior similar to an alluvial bed when critical stress for mobility is surpassed. … Thus, it seems plausible that erosion of well-jointed rock by large floods might be extremely rapid, such that canyon formation is limited by the capacity of the flood to transport plucked blocks rather than by the plucking process itself. In other words, the bedrock which was eroded during the flood was already slowly eroding through the formation of joints (a type of fracture) in the rock. The high-energy flood event took advantage of this weakness and literally plucked large boulders of bedrock from the floor and walls of the canyon. In this case, the slow and gradual processes of joint formation worked in concert with the catastrophic flood event to produce this result. There will be some who will use this paper to attempt to tear down uniformitarianism. Not only will they fail to mention the nuances of this specific study but they will be tearing down an idea that has long since been discarded by geology. * see this post at 4.5 Billion Years of Wonder for more commentary about this paper within the context of Bretz and the origin of the Channeled Scablands of Washington. Excellent perspective Brian – I’m glad you’ve taken this on, because it had also struck me that the press surrounding this paper could easily be twisted by the creationist mob. However, I would like to point out that the original uniformitarism/catastrophism debate in the early 1800s was more a clash between those who thought the geological record can be understood in terms of ongoing processes that could be observed in operation on the Earth’s surface, or in fact recorded something entirely different with no modern equivalents (for example, the idea that granites had been precipitated from a global ocean). If you read Lyell, he is principally arguing for this uniformity of process, rather than uniformity of rate. Gould seems to gloss this over this distinction, and for this reason the paper you quote has always slightly annoyed me. Although it is possible he is reacting to how the uniformitarian concept developed in the late 19th and early 20th centuries (something I’ve yet to really look into in depth), I can’t help feeling that he slightly over-eggs his pudding (remember that at the time he was trying to push his punctuated equilibrium concept of evolution). Chris, good point — I haven’t studied Lyell to the degree you have. My reading of what Gould says in his paper is, as you say, a reaction to how uniformitarianism was being considered in the 20th century. The other part of this that I only touched on is the spectrum of magnitudes/frequencies of events and how what we consider catastrophic and infrequent is really quite normal and regular. That is, if Lyell was arguing uniformity of process, doesn’t that process assume a range of magnitudes/frequencies that are observable over human time frame? I think you’re exactly right, Brian – there is still some difficulty grasping what actually counts as a ‘regular’ process (in the sense that it makes a identifiable and long-term contribution to the rock record and planetary evolution) when viewed within the context of Deep Time, and I think we geologists are still working through the implications of this. Extra-terrestrial impacts would be one high-profile example of where perhaps human notions of time warp scientists’ perspective a little too much – although it is by no means the only one. Looks like an interesting paper. Might be a touch out of my level. Would you say it’s accessible to a high standing 2nd year geology undergrad? How many pages is it? I have some additional links and discussion of uniformitarianism and a bit on the Scablands at this old post on LFD. Also, Gould’s article is posted here. Garry’s post got me to thinking: many/most western desert intermittent streams (dry washes) are subject to occassional huge floods, which can strip to bedrock (usually not into it or far into it) during flash floods. The magnitude and result may be smaller than the rapid flood above, but results can be quite spectacular, especially if you know what the canyons looked like prior to the flash flood. Two examples: Northumberland Canyon, 1979and Meadow Valley Wash, 2004. I am a YEC creationist and interested in geomorphology and this case indeed. In fact it not only makes a flooding good case for how bedrock is carved up into canyons, potholes and so on BUT it makes irrelevant other ideas of formation. There is no need to see anymore that there is convergence of landforms by different processes. There is no need to speculate that slow processes ever did anything. the origin of all like formations has been explained by this unique event. No need for anything else. Long term concepts were never witnessed and were wrong. The power of instant fast water can explain most geological formations the product of water. While Stephen Gould’s approach was quite relevant, we have a new beast in the room. The ever-present specter of the YEC (grasping at any straw they can find) continues to confound serious attempts to research any catastrophic event within the past 1 million years. One only needs to review the disparate predictions as to the effect SL-9 would have on Jupiter. Even the most optimistic were surprised at the scale of the event. Now, having witnessed two additional large-scale impacts on Jupiter, the statistics may finally be catching up with reality. In the case of the Carancas impact event of 2007, the initial take by the public face of impact scientists was that it could not have been a meteorite impact. We have progressed from the “they all burn up in the atmosphere” of 60 years ago, to a rational respect for the danger thanks to Shoemaker, and now we are back to “they all burn up in the atmosphere”. The real risk here is that scientists (and reviewers) assume that any catastrophic conversation MUST be viewed with distain, and blacklisted as YEC-inclined.